Our ten-year-old likes arts and crafts. She spent a couple of hours on Saturday afternoon making pillows and pincushions from old t-shirts, fabric, and felt. She doesn’t work in silence, though; she had Adventures in Odyssey playing on the Kindle the whole time! 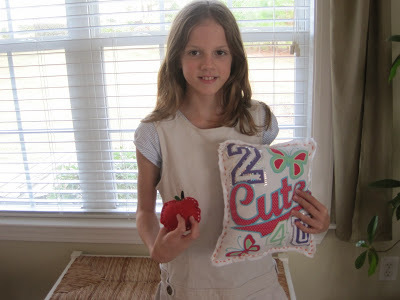 Her older sister joined in the fun for a little while, making the blue circle pillow from an old shirt. A new project she tried was making the tote bag; adding a pocket on the front was her own idea. My daughter suggested that I get her a gift card to Jo-Ann’s Fabric Store for Christmas so she can buy new supplies. I’m glad she’s developing this skill because it’s one I lack! 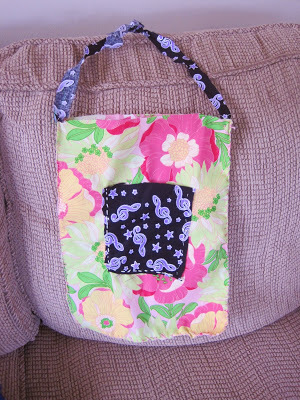 I sew more than I ever thought I would, though it’s not the fun, creative stuff. It’s stitching in waistbands to tighten them or sewing a button back on a shirt. .
Do you sew? What arts and crafts projects do your children enjoy? Oh, boy! What great work your daughter does! Have you taken her for any classes? My oldest went through a cross-stitching phase, but she hasn't sewed on her ornament in a couple of months. Other than that, all of my children love to draw, and I expect it won't be too long before they start showing interest in other arts and crafts. No, I haven't taken her for any classes yet, but that's definitely something I still want to do. Maybe I need to add it to my goals list for 2014! I think she would enjoy cross-stitching and knitting, too. An ornament sounds like a great project! She did a great job. Such cute projects. I'm sure she'd enjoy the gift card. 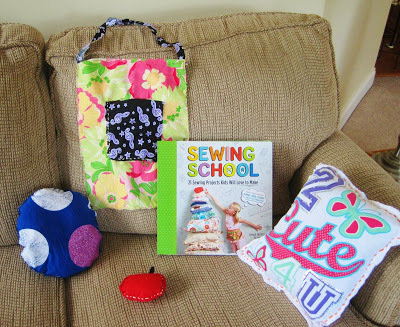 My 10 year old likes to sew too. She likes to design and sew clothes for her dolls. I used to sew a lot. Now I mostly just mend things.